Above: Off to the market in a striped-T, a pair of clogs and my overalls. Where my clothes are concerned, I am an unabashed comfort seeker. Still vain enough to prohibit the “comfort creep” from over ruling style though, I have worked hard to build up a wardrobe of a few beautifully cut loose tops and baggy trousers. Perhaps most emblematic of my sartorial philosophy where comfort and style happily coexist are my beloved overalls. I own 3 sets for seasonal and dressing-up reasons but my signature pair transcends all seasons and occasions — like magic — bar the most formal. Purchased in Spitalfields Market a little over 4 years ago from a trader of vintage French workwear, my signature overalls used to belong to a French railway worker. And from the way they have been patched and re-patched — I’ve even added my own — these were possibly his only pair. They started as what can only be described as French blue and through many hundreds of washings, they are now many variations of blue from faded French blue all the way to hues of darker royal blue found in the patches. Which means, of course, that no matter what you wear with them, it will match. 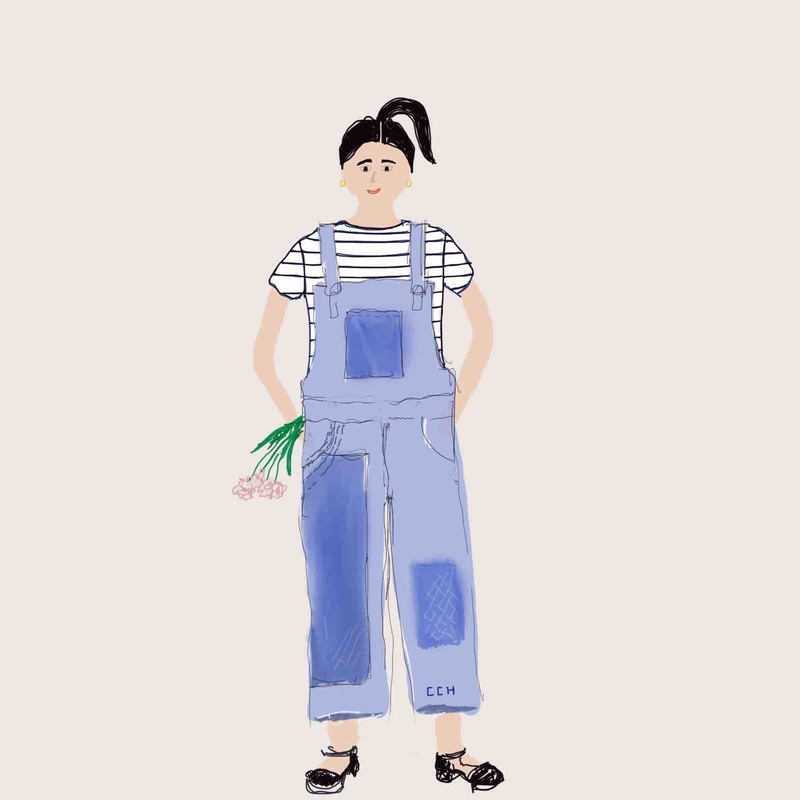 I have worn these overalls everywhere and with everything — from white T’s to black silk blouses, trainers to heels. A slight adjustment in accessories can change the entire look. And their ability to incorporate layers results in a micro-climate bespoke to your own personal design. Their versatility means I have donned them for lunch, dinner, the cinema, the theatre, grocery shopping, market shopping and even Bond Street shopping. On one occasion, I wore them for twelve continuous hours going seamlessly from an all day art class to an evening Halloween party. Putting them on always guarantees a couple of compliments as well, especially from young shop assistants or the female friends of my twenty something sons. So I guess they’re on the right side of trendy too. I bought my first pair of overalls when I was fourteen — gray and white ticking-striped OshKosh B’gosh’s. Remember those? I have tried in vain to source some more but have not been successful as of yet. I have found many others that I wouldn’t mind wearing but in the spirit of the French railway worker, a girl only needs so many pairs. So as not to let me research go to waste, here are a few I have been admiring should you be inclined to join the overall-wearing brigade. Jackie Parsons, founder of Scobel Clothing, has copied this pair of Denim Dungarees, dating from the 1920’s and inherited from her grandmother. Similar to mine, her original overalls have been over patched as well — only hers are with various types of gingham. These denim ones from American workwear brand Carhartt come in two denim washes — Dark Stone Washed and Light Stone Washed. This pair in Black Canvas from French eco-retailer Baserange will definitely take you from day to evening. Many Vintage Styles , but alas not my striped OshKosh B’gosh’s, can be found at Rokit. P.S. And for those of you who are practically inclined and a fan of pockets, overalls — like a best friend — have always got you covered. Above: My summer linen pair from Italian designer Daniela Gregis. Don’t be scared off by the designs where one size fits all — the extra volume makes for an interesting silhouette and copious amounts of comfort. I’m with you, Christine! As someone who spends most of my days in an industrial kitchen, I dress for comfort but I also like to feel like ‘me’ and be able to go straight into customer meetings if necessary. I usually wear a selection of denim workwear – dungarees/overalls, apron dresses, long straight skirts. Rarely jeans, although I have some cropped wide leg ones (Muji) that are handy in the Spring/Summer and Summer/Autumn transitions! They are all so easy to wear, are resilient and look better the more they are washed (another important factor for me!) I really love to hear about the clothes that women wear everyday for work, whether inside or outside the home. Endlessly fascinating! Have a great weekend. Thank you for your interesting comments about workwear and for sharing the solutions you have come up with for working in an industrial kitchen. I agree clothes that get better the more they are washed occupy a large portion of real estate in my closet! Like you, I too am fascinated by what women wear. So much so that in every Fabster interview, I have asked for the interviewee’s “Wardrobe Wisdom”. There have been some great nuggets of advice — no surprises there! Many thanks again and all the best, Christine. Good to be reminded of classic Oskosh b’gosh! Oh Rosanna — did you wear them too? Thank you for today’s post. I have been a shameless wearer of overalls since I fell for a pair of railroad style overalls in the 4th grade over 40 years ago. I enjoy wearing two pairs from the GAP circa early 90s for work around the house and garden and a more recent style from Free People that I bought in two sizes — for good days and not so good days, if you know what I mean. And sometimes this girl still wants to go bra-less and overalls are the perfect cover for that, too, lol! 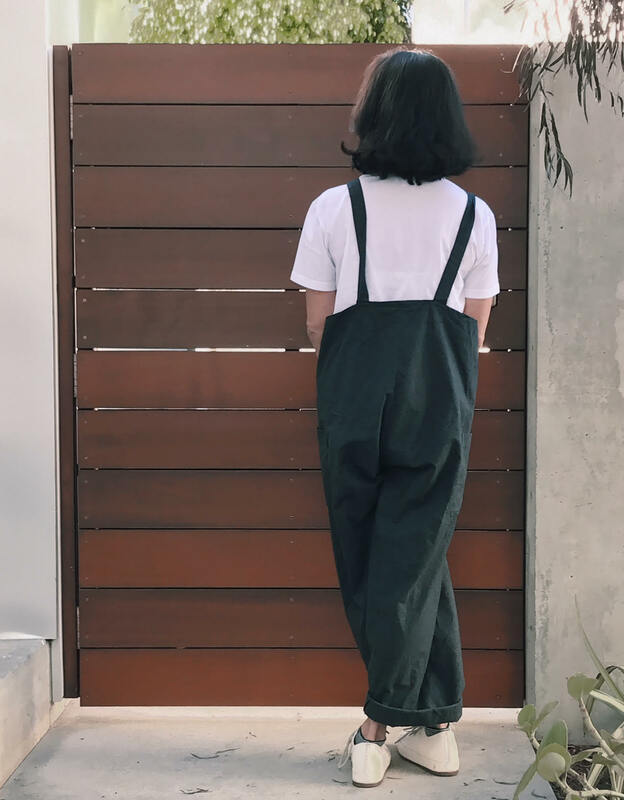 This overall would completely suit me as I like to wear extra comfortable clothes. Keep posting more such stuff.